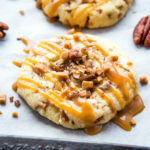 These Caramel Butter Pecan Cookies are the perfect easy-to-make drop cookies for caramel lovers made with chopped pecans! Preheat your oven to 350 degrees Fahrenheit and prepare a baking sheet by lining it with parchment paper. Set aside. Cream the butter and sugar together in a stand mixer on medium-high speed, or in a large bowl with a hand mixer until light and fluffy. Add the egg and vanilla and mix well until combined, scraping down the sides of the bowl. Add the flour, baking soda and salt, and mix until a dough forms. Add the pecans and Skor toffee bits and mix together just until they're incorporated into the cookie dough. Drop by the spoonful (or roll into balls with your hands) onto the prepared baking sheet and press the cookies down slightly before baking. Bake for about 8-10 minutes, or until the cookies lose their shine on top. Remove from the oven and let cool on the pan for about 5 minutes before moving to a wire rack to cool completely. Top with extra pecans, Skor toffee bits and caramel sauce for serving. These cookies store well (minus the caramel sauce) in an airtight container at room temperature for up to 5 days.